Stephen Coombs, in his introductory notes to this new album, expresses his surprised delight at the current "resurgence of interest in the music of Reynaldo Hahn. Until relatively recently his posthumous fame relied on a single short song, Si mes vers avaient des ailes, written when the composer was only thirteen. Amazingly, a glance at the current recording catalogues reveals an ever-growing list of works � concertos, symphonic works, songs, piano pieces and chamber music � by this urbane and charming composer." And urbane and charming is an apt description of the opening movement (marked Sans lenteur, tendrement) of Hahn�s Violin Sonata. Inspired by Fauré, it is sunny and lyrical and sweetly sentimental with just a little discreet passion and yearning. Like so much of the composer�s music, it seems to conjure a forgotten, by-gone age of horse-drawn carriages (even though it was written in 1926); or cosy visions of agreeable afternoon salon music or domestic entertainments. The short central movement, marked Véloce is a sparkling little scherzo that canters along with a harp-like central section while the concluding Modéré movement marked, très à l�aise, au gré de l�interprète begins plaintively and proceeds slowly, gently in melancholic musing and reminiscences. In the middle of this movement gentle sorrow is roughly pushed aside by heavy strident piano chords before the music slowly calms again and the charming memorable melody of the work�s opening is recalled. Coombs and Sewart capture the essential charm and sentimental yearning and nostalgia of this enchanting sonata most exquisitely. Of the shorter pieces in the programme, the Soliloque et Forlane has a serene yet increasingly longing Andante before the arrival of the sprightly, jaunty Allegro scherzando section. Hahn�s beautiful forlorn Nocturne, with its restrained passion, has another haunting melody (shades of Elgar). The Romance, marked Très modéré, flows easily and has something of a folksong about it and yet it might also be thought to speak of domestic bliss, an endearing, pretty little tune. Si mes vers avaient des ailes (�if my verses had wings�) is of course Hahn�s transcription, for cello and piano, of his famous original song and how lovely it is; amazing that this gorgeous tune was composed by a boy of thirteen. The notes include the text of Victor Hugo�s poem that Hahn set to such sublime music. The other major work in the programme is the Piano Quartet No. 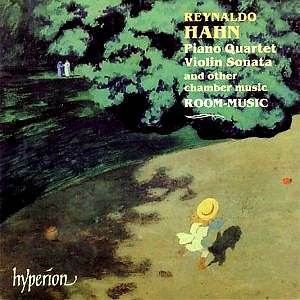 3 in G major and straightaway we are introduced to yet another of Hahn�s beguiling melodies that speaks of relaxed intimacy. But this belies a much deeper work, exploring more than salon superficiality for the middle of this movement delves into troubled deep waters with altercations between the strings and harsh piano comments. The brief second movement, the waltz-like Allegro assai, is a much edgier creation than we are used to hearing from Hahn. The opening murmurs and tenors of the Andante are of a shadier hue, too, as though Hahn is recollecting some deeply felt loss. (This late work, from 1946 quite probably commented on private and public tragedies of that decade). Room-Music sensitively capture the refined, elegiac quality of this, the emotional heart of the Quartet. The work ends with Hahn�s more familiar easy-going, warm-hearted, nostalgia in the Allegro assai finale.